The “A la Carte” or Optional plugins are not automatically installed when you install CBOX Classic. If you want to use one of these, select its checkbox and click on the blue update button to install the plugin. Then you can toggle the activate/deactivate hyperlink from the CBOX Classic dashboard. Once installed, these optional plugins will be managed by CBOX Classic. The BP External Group RSS plugin lets a group’s administrator attach one or more external blogs to a group. Once attached, the activity from these external blogs will appear in the group’s activity stream. This is an optional plugin and will need to be selected when installing Commons In A Box. Documentation: See the plugin page. Authors: Developed by Andy Peatling and modemlooper. 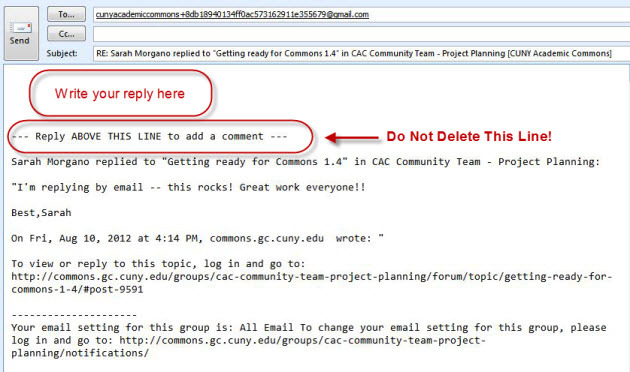 The Reply By Email plugin lets members reply to group forum posts from the comfort of their inboxes. Rather than logging into the site and going to the group forum page, members can post forum topics and respond to them from their email client. Authors: Developed by Ray Hoh in conjunction with the CUNY Academic Commons. Support: Support for this plugin can be found here or on FAQ page.